It’s the best of both worlds, really. A home on a farm, in the country, with all the rustic trappings that make a modern farmhouse so cozy but also filled with all of the fabulous modern furnishings and accessories that make living so easy. (And chic!) Take a peek inside this stunning home from Chango and Co. It’s guaranteed to have you dreaming of the simple life! We don’t know about you, but, with only a couple weeks left of summer vacation, we are in mourning! Fortunately, there is still time to savor these last few weeks of summer and tour this fabulous home by Geoffrey Chick. Taking its color palette from nature, this house couldn’t feel more relaxing or refreshing. Easy slip covers and no-fuss floors are perfect for wet feet and sandy bathing suits. And you know there’s nothing we love more than a pop of blue! A wide farmhouse sink is perfect for washing fresh-caught fish. And tall ceilings and big windows allow for plenty of light. Unique art–like these framed bathing suits–adds so much charm. Painted plank walls and vaulted ceilings are two of our favorite things. The only thing better than the two of them apart is the two of them together! And that upscale finishes like marble are juxtaposed with casual wood to maintain that beachy feel. What’s a beach house without a bunk room? And a double double is perfect for housing a family of guests. The only thing better than the interior of this summer vacation spot is the exterior. Geoffrey Chick has thought of everything! Even though summer might be drawing to a close, we’re wishing you blue waters and sunny skies for a long, long time! Few trips are as quintessentially summer as the family beach trip. And, while life (unfortunately) doesn’t always allow for a summer away from the real world, fortunately, we can be there today wherever we are! This Niantic, CT house is absolutely everything a summer house should be. Relaxed, casual, completely unfussy yet totally refined. It’s the kind of place that looks like generations of family members have spent their summers and generations more will continue to. While painted shiplap adds an old world feel. 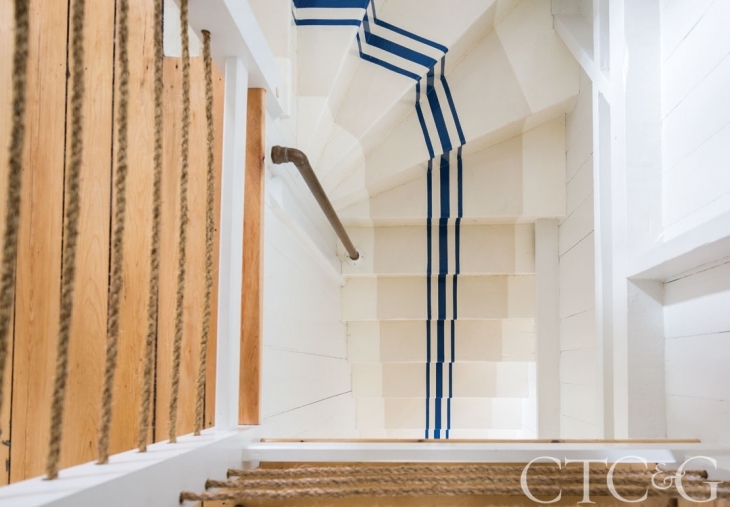 Cute accents like a rope ball and ship’s lanterns add coastal touches without being kitschy. And a clawfoot tub is the perfect spot for washing the sand down the drain at the end of the day. Bamboo blinds are all these rooms need–and collect far less dust during the off seasons than curtains. And a bath updated in all the right places and preserved and others maintains the upscale coastal charm feel. Wherever you are today, we hope you enjoyed this trip to beautiful Niantic as much as we did. Tour the beautiful home of our friend, Bethany Powell in the Style at Home Magazine. Bethany is the daughter behind the fabulous mother-daughter duo of Powell Brower Interiors! I AM SO, SO, SO EXCITED THAT SLIGHTLY SOUTH OF SIMPLE WAS CHOSEN AS A KINDLE AND BARNES AND NOBLE NOOK MONTHLY DEAL . GOOD UNTIL APRIL 1, YOU CAN READ THE FIRST BOOK IN THE PEACHTREE BLUFF SERIES FOR ONLY $1.99–JUST IN TIME FOR THE THE SECRET TO SOUTHERN CHARM RELEASE ON APRIL 3. Happy Easter, friends! Hope the bunny was good to you all! We are SO excited because The Secret to Southern Charm officially launches just three days from today! We can’t believe it! To celebrate, we are giving away a $200 Target gift card so that you can stock up on all your favorite beach accessories before those warm, lazy days of summer are here.